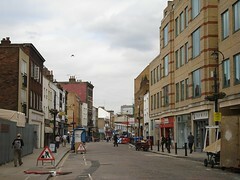 Lower Marsh is a street near Waterloo Station. According to a sign at the south end of the street, its name comes from its location, which was previously the site of Lambeth Marsh. It's hosted a street market since the mid-1800s, and was designated a conservation area in 1984. Every lunchtime (may just be week days) there is a takeaway food market. When secretlondon visited there were stalls selling takeaway Chinese and Indian food. As of early 2014, there's a Saturday market too. Last edited 2014-10-23 11:00:14 (version 6; diff). List all versions. Page last edited 2014-10-23 11:00:14 (version 6).